May 30, 2018 – Captain Greg ran the Super Voyager III on an overnight trip this past weekend. All four boxes were completely full upon arrival at the docks. The limit of Red B-Liner Snappers was reached. They also caught Triggerfish, Grunts, Porgies, Cobia, Amberjack, Rudderfish, and many many Grouper, both Gag and Scamp. Weather offshore was fabulous. The next over night trip departs Friday, June 1st at 9PM. April 30, 2018 – Captain Larry has fished the Gulf Stream the last two weekends on the Super Voyager with great success. They crushed them Saturday. The boxes were full of Red B-Liner Snappers, Grunts, Triggerfish, Big Porgies, Rudderfish, Large Sea Bass and Amberjacks. Grouper season opens tomorrow, May 1st. Drift lines are starting to catch King Mackerel and Mahi Dolphin. 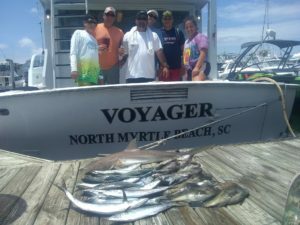 The offshore private sport fishing charters out at the blue water trolling … Wahoo, Mahi Dolphin and Black Fin Tuna have been biting very well. Thew 1/2 day and 3/4 charters have been catching Spanish Mackerels, Bonita Tuna and Sharks. The 1/2 Day Party Boat Fishing on Super Voyager and Starship have been catching plenty of Black Sea Bass, Porgies and Shark. 1/2 Day & 3/4 Day Trips – Spanish Mackerel, Baracuda’s, Bonita Tuna, & Large Blacktip Sharks Are Being Caught On These Trips. 9 Hr Offshore Trips – Trolling & Bottom Fishing – Excellent Offshore Fishing Trips – Bonita Tuna, King Mackerel, Amberjacks, Barracuda, Cobia, Grunts, Large Sea Bass, Porgies & Grouper are Filling Up ohe Boxes on These Trips. 11 – 12 Hr Gulf Stream Fishing Trips – Both Trolling & Bottom Fishing – Trolling – King Mackerel, Mahi Dolphin, Amberjacks, Bonita Tuna, & Cobia. On The Bottom – Red Beeliner Snappers, Grouper, Grunts, Porgies, Triggerfish & Pompano are Caught. 12 – 13 Hr Gulf Stream Bottom Fishing – Red Beeliner Snappers, Grunts, Porgies, Triggerfish, Rudderfish, Pompano, Large Sea Bass, Amberjacks & Grouper. On The Drift Lines – Mahi Dolphin, Wahoo, Blackfin Tuna, Sailfish & Large King Mackerel. 12 – 13 Hr Blue Water Trolling Trips – Wahoo, Mahi Dolphin, Black Fin Tuna & Sailfish. Blue Water Trolling Gets Really Good as the Water Starts Cooling Off in the Fall. 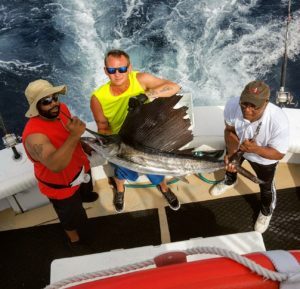 Gulf Stream Fishing – Red Beeliner Snappers, Grunts, Triggerfish, Pompano, Porgies, Grouper, Amberjacks & Rudderfish. 1/2 Day Party Boat Fishing – Sea Bass, Porgies & Atlantic Sharpnose Sharks.